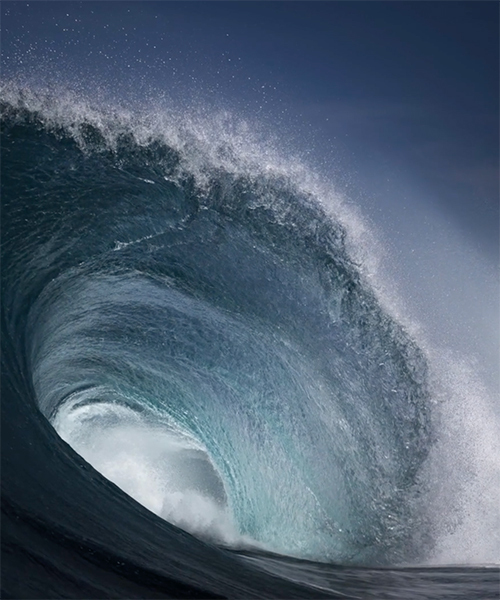 created by dutch cinematographer armand dijcks and australian photographer ray collins, ‘the infinite now’ is a short film composed of breathtaking cinemagraphs of ocean waves, heaving and crashing in perpetual motion. each cinemagraph is created using one of collins’ own still photographs, setting the image in an infinite loop of sea, salt and sky. captured in intricate detail, one might at first be fooled into thinking the moving image is a slow motion video shot. in reality, the footage is a composite of different still images, arranged in a perfect loop, where beginning and end is not always clear. the resulting vignette is defined by a continuous sense of movement that encapsulates the beauty and strength of the ocean. ‘the infinite now’ is both emotionally moving and slightly scary, demonstrating the sheer scale and power of the ocean waves. enormous swells of blue are caught just on the edge of impact, threatening at any moment to explode onto the water below. ‘the nice thing about this technique is that it lets you take an infinitesimal sliver of time, and see it in motion indefinitely’, he continues. ‘when I showed some of these cinemagraphs to andré heuvelman, trumpetist at the rotterdam philharmonic orchestra, it inspired him to get together with pianist jeroen van vliet to create a bespoke soundtrack for this cinemagraph series.’ the final product is a combination of sound, image and atmosphere that captures a single moment experienced ad infinitum. In the surfing community these waves are called “slabs” for obvious reasons: and usually there is a reef a few feet below ….